I recently came across a recipe on Facebook for Healthy Ice Cream Sandwiches. (I tried to post the link but can’t find it so you’ll have to trust me.) I was a bit skeptical but they tasted great. The kids loved them and even the hubby gave me his grudging seal of approval, so I knew I had to share the recipe with you. And believe it or not, it only requires three ingredients! 1. Put the strawberries and cool whip in a blender. Add a tbsp or two of water and then blend. If you have a food processor, you probably won’t need the water. 2. 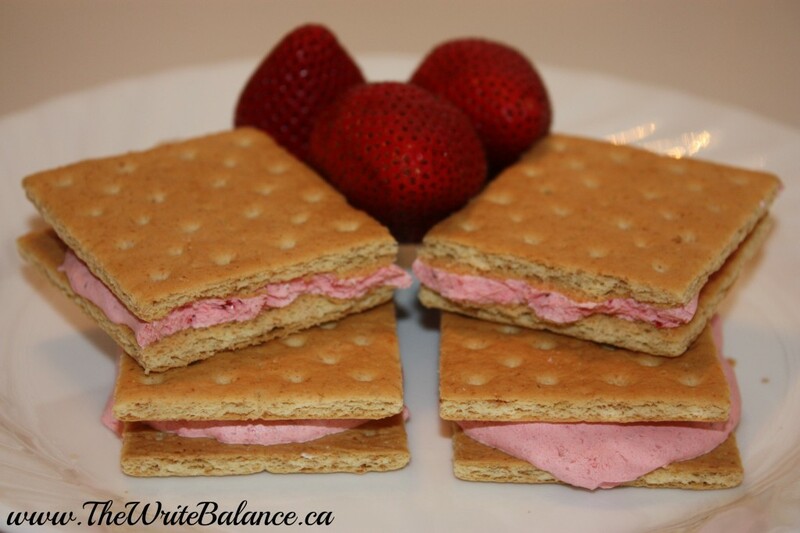 Spread some of the mixture on a graham cracker, then put another graham cracker on top to complete the sandwich. 3. Freeze for 30-45 minutes. Then enjoy! Looks nice – not sure that two of the ingredients are down under – but I am sure we could do something close. They look tasty. Of all the things I miss with going gluten free, graham crackers are right near the top of the list. These look scrumptious. These look tasty! Now I want to figure out how to make these for myself! I bet you could do these for different holidays too. Gosh it’s funny, but the only one of those ingredients I know is strawberry! I have heard of graham crackers, and I thought they were similar to what we call digestive biscuits, but from your photo I think I was wrong! I will have to investigate now!